UK / World Release Date - 10th February 2017. Japanese Release Date - 27th January 2017. Album Type - Live Album. A double live album release recorded in Detroit, MI on 15th July 2016 during the band's summer tour with REO Speedwagon/Tesla.. Initially announced before the show as being recorded for a future AXS TV special and DVD release, it was shot before a 14,000+ capacity crowd at DTE Energy Music Theatre. Featuring new songs 'Let's Go', 'Dangerous' and 'Man Enough' from the 2015 self-titled 'DEF LEPPARD' studio album. The first Def Leppard concert filmed in full at an outdoor amphitheatre in the USA. "What was really cool. I mean we actually just recorded one of the shows just a few weeks ago. We was live in Detroit and we're putting a DVD out. And you know I don't usually get a chance to see the show. You know unless I'm like turning around and catching a little look here and there." "But we had to approve all the images and the sound and everything. The mix and it looked amazing. The show's amazing. So that's another thing we still have coming out. I'm not sure of the exact date of it at the moment. But Def Leppard Live In Detroit should be a DVD coming out at some point. And it looks spectacular." "Def Leppard rock Detroit! In the summer of 2016, Def Leppard's world tour rolled into the DTE Energy Music Theatre on the outskirts of Detroit. As the sun began to set over a packed crowd the huge video wall behind the stage came to life with the exploding image of the band's latest album cover and Def Leppard began to power their way through a stunning setlist of classic hits and new tracks. Featuring superb surround sound and amazing visuals this film captures the full-on experience of Def Leppard live in concert like never before." Legendary rockers Def Leppard excited and thrilled fans nationwide with their massive 55+ city Summer 2016 North American tour. Def Leppard will now share their masterful performance on DVD and Blu-ray. On February 10, Eagle Rock Entertainment will release their epic concert film And There Will Be A Next Time – Live From Detroit on DVD+2CD for $21.98, Blu-ray+2CD for $26.98, and Digital Video. With two prestigious Diamond Awards to their credit, Def Leppard continues to stand tall in the music industry and deliver some of the most iconic rock melodies and memorable anthems of all time. Most recently, their 2015 self-titled album featured singles “Dangerous” and “Let’s Go” which premiered via RollingStone.com and hit #1 on the Billboard Top Rock Albums Chart. 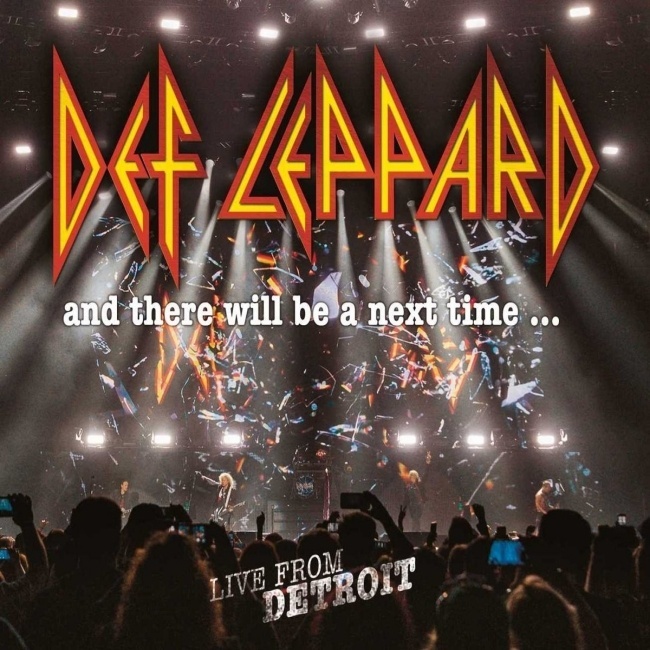 Filmed at the DTE Energy Music Theatre in Clarkston, MI, And There Will Be A Next Time – Live From Detroit is an incredible showcase that captures the electrifying energy and power of Def Leppard live today. As the sun began to set over a frenzied Detroit crowd, Def Leppard’s legendary hooks and anthemic rock served up an audiovisual feast second to none. The audience were served hit after hit with fan favorites from across their iconic career.